Dr Ferraccioli was a principal investigator on the AGAP (Antarctica’s Gamburtsev Province) project. 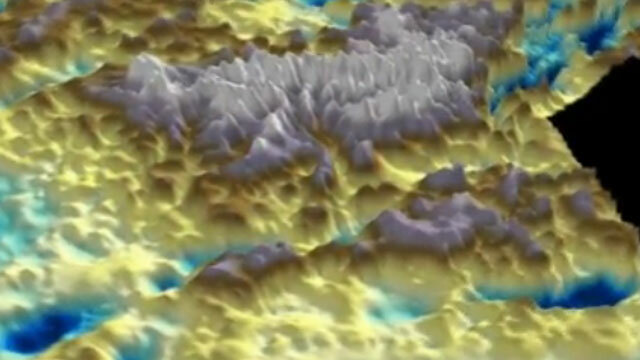 This multinational effort in 2008/2009 flew aircraft back and forth across the east of the White Continent, mapping the shape of the hidden mountain system using ice-penetrating radar. Other instruments recorded the local gravitational and magnetic fields, while seismometers were employed to probe the deep Earth. The AGAP team believes all this data can now be meshed into a credible narrative for the Gamburtsevs’ creation and persistence through geological time. It is a story that starts just over a billion years ago, long before complex life had formed on the planet, when the then continents were drifting together to create a giant landmass known as Rodinia. The resulting collision pushed up the mountains, and also produced an underlying thick, dense “root” that sat down in the crust. Over the course of hundreds of millions of years, the peaks would have gradually eroded away. Only the cold root would have been preserved. Then, about 250-100 million years ago, when dinosaurs roamed the planet, the crust started to pull apart in a series of rifting events close to the old root. This rifting warmed and rejuvenated the root, giving it the buoyancy needed to lift the land upwards once more to re-establish the mountains. Further uplift still was achieved as deep valleys were later cut by rivers and by glaciers. And it would have been those glaciers that also wrote the final chapter some 35 million years ago, when they spread out and merged to form the East Antarctic Ice Sheet, entombing the Gamburtsevs in the process. Posted on January 4, 2012, in antarctica, research. Bookmark the permalink. Leave a comment.